← Which is More Dangerous: Cash or Credit Card? True confession time! I smoked cigarettes for over 20 years. Here’s my story and some tips for you if you are a smoker wanting to quit. Dad claimed that the only thing my college days did were to make me into a smoker! I come from a family that never smoked – generations that never smoked. I didn’t know anyone who smoked. I never smoked in high school or hung out with kids who did. So what happened? It was my boyfriend’s example in college. He was a fraternity rat down at the school of mines and I wanted to be cool like him, so I joined a sorority. But that wasn’t enough, I decided to try cigarettes, almost on a whim, to see what they were like, because he smoked. The sorority handed out bowls of cigarettes to freshman girls during rush week and we smoked while we rushed them! Once I broke up with the boyfriend who got me started, I ended up with a fiance who smoked too! My college freshman roommate tried to talk me out of smoking, without success. I was soooo smart (do you hear my sarcasm?). Back then, in the late 60’s/early 70’s, cigarettes were only fifty cents a pack. Vending machines all over campus and in convenience stores and regular stores all sold them. You could smoke whenever and wherever you wanted (second hand smoke problems – no one cared back then!). Every table had an ash tray, every car had a lighter. Smoking was cool. Health concerns were not heralded on evey pack or on every billboard and TV/Radio station. It wasn’t a general public concern back then. Nice middle class Moms (non-smokers) just considered it a nasty, dirty habit – not a threat to their kids. It was a weight control measure. You picked up a cigarette instead of a sandwich. It was better than smoking pot or doing drugs, right? Fast forward to the 1990’s and Marie is still smoking. She smoked in the house (as did hubby) while the kids were growing up. She smoked at work. Then things started to change. Smoking inside the office was banned. Now the smokers lined up in the alley outside, shivering in the winter to get a drag or two to get rid of the nicotine fit. Your boss looked at you sideways if you put your coat on to go outside for a smoke. Smokers took too many breaks! It was 1997 before I decided to stop smoking. Cigarette prices were beginning to go over the top, I found out my boys had started smoking, based on our great example and I was tired of being a slave to an addiction. My solution was to use nicotine gum. It took several false starts to move from the cigarettes to the gum, but I finally made it. The gum was expensive, and our health insurance didn’t help with the cost. Unfortunately, I chewed that gum way too long. It not only cost a fortune to buy for all the 6 years (yes, 6) I chewed it, but it ruined my teeth – cracking about 5 molars so badly I had to get crowns (and at $1K a pop, that’s expensive!). During that time, hubby had a pretty significant heart attack. The day after the stents went in, the doctor told him “You have already stopped smoking, as of yesterday”. Smoking is that bad for your heart. Finally I found a gum that was gentler on my teeth and had a nice little kick to it (Eclipse mint) that allowed me to actually finally get off of nicotine. I wish I’d never started, like most people. I wish that more because my son’s copied my bad behavior and one of them is still trying to kick the nicotine gum habit! The other succeeded long ago in stopping smoking. Only 10% succeed on their first try. 90% of people who quit do it this way. Gradually reduce the number you smoke. 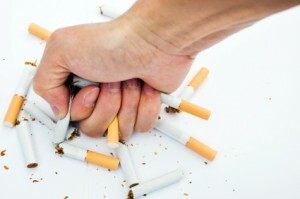 Some folks can gradually withdraw by reducing the number of cigarettes they smoke in a day. This never worked for me. Use a therapist to find your triggers and come up with ways to not act on them. My next door neighbor tried hypnotherapy and claimed it worked for her. Nicotine gum, patches, inhalers, sprays, and lozenges are nicotine replacement therapies (called NRT). Replacement nicotine helps you quit smoking, but still leaves you addicted to nicotine. Zyban and Chantix are two that are sometimes prescribed to help you stop. Remember that the first few days are always the hardest. Be aware that you are fighting a physical addiction and be strong minded and stubborn – don’t let your body rule your mind! If you feel like you want a cigarette, do something else for a minute. Grab a piece of gum, drink some cold water or fizzy pop or take a walk. Don’t drink alcohol for the first few weeks, it will lower your inhibitions and you will justify having a smoke! Find something (socially acceptable) to put in your mouth when you have a craving – a straw or tooth pick perhaps. Don’t chew the darn nicotine gum for 6 years! Remind yourself how much money you will end up saving – due to not buying cigarettes and avoiding health concerns. Think about how much easier it will be to hike up those hills when you can get a full lungful of air. Quitting smoking lowers the risk of diabetes, lets blood vessels work better, and helps the heart and lungs. Quitting while you are younger will reduce your health risks more, but quitting at any age can give back years of life that would be lost by continuing to smoke. Just don’t start. Period. Believe it or not, I sometimes still get a craving after having been completely off nicotine for more than 10 years and after not smoking for 16! Have you stopped smoking? How did you do it? Congratulations on sticking to it! I had no idea the gums could damage your teeth so much, that must have been very annoying to damage your health even more and have to pay for crowns. Thanks. I really do feel much better. To be honest, as I think I said above, I chewed that gum years longer than the drug company intended. Me too. It is so expensive in so many ways. As a smoker, I once went from the mid-west to stay a week in Breckenridge – and could hardly walk up a flight of steps when I got there! Wow. Different age! And how frustrating to get hooked by your younger, dumber self–I guess addiction is something like debt, where bad decisions you made a long time ago continue to impact your life many years later. Yep, smoking was cool back then…. No – I’ve never taken it up. But I hear it’s very, very hard to quit. You should be very proud of yourself! Congratulations! Nicotine programs tend to have huge impact. Brilliant work. They do help a person with the addiction. This is amazing~I have never smoked,but my mom did. She has quit for over a year now. Her heart problems pushed her to quit. Great accomplishment!! Congratulations on joining the smoke-free gang! We both quit smoking in Jan 2012 and are still smoke-free today. We both had a few pieces of the nicorette gum and the rest was will power. Life trumps smoking for us… at least if we can cut it out of the equation. We’ve also cut our life insurance premium costs in half! I cut my life insurance cost to zero, but then since I have no dependents, I don’t need life insurance – not related to smoking cessation in my case!